If you are looking for that wonderful frothy white to fill in any gaps in your garden this little one is for you. 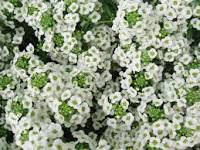 Plant alyssum and it will reward with it's subtle fragrance. Also plant this month aster, cockscomb, ageratum, balsam, celosia, coleus, gomphrena, vinca, impatiens, marigold, salvia, sunflower, torenia and zinnia. Bougainvilleas and Hibiscuses need fertilizing every six to eight weeks with commercially specific bougainvillea and hibiscus food. 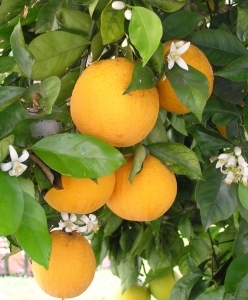 With new fruit development on out citrus trees it is time to use either citrus food or old poultry manure over moistened soil around the drip line of the tree. Make sure you have opened up the inside of the tree (to a vase shape) to allow maximum air and light to the middle of your tree. Keep up the regime of spraying with white oil as a preventative measure against leaf curl. Consistent watering is best for citrus, so while we still have dry weather it might be an idea to give them a good drink. 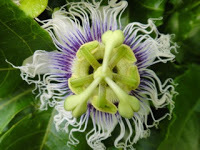 Passionfruit are gross feeders so an application of blood and bone (4 parts) mixed with potash (1 part) at six to eight week intervals maintains foliage colour, plant and fruit production.